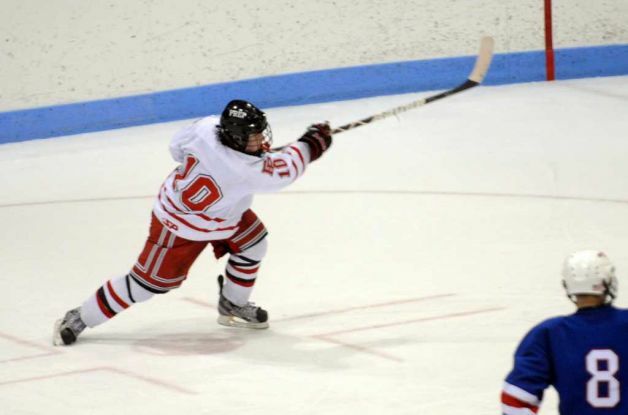 Fairfield Prep moved to (12-0-0) on the season with a 6-2 shellacking of Xavier last night at Ingalls Rink in New Haven. The Jesuits are now 7-0 against CT competition and 5-0 against out of state foes. But it's the manner in which they are winning. It's been well chronicled that their defense is key and that was no more evident than last night. It took Xavier nine minutes to get a shot on net. Prep kept trudging along, getting their shots on Xavier junior goalie Paul Hotchkiss, knowing that one or two or six would eventually get past him. Prep, in the limited sample size I've seen of them this year has continually won the war of attrition. They stifle the neutral zone, clog up passing lanes and force numerous 1 on 3's which result in zero quality chances for their opponents. Xavier is a good team, a team that I boldly claimed could challenged the state's best after seeing them in the West Haven Xmas Tournament. They looked pedestrian last night, a common foe, just another feather in Prep's cap. Prep still has Hamden, twice, both ND's, Darien and Catholic Memorial (MA) left on their schedule but by the way things are looking it doesn't appear that it will matter. I'd say NDWH has the best shot for an instate team but it would take a near perfect game, maybe they'll save it for the CIACs. Who Are You East Haven? While I don't think East Haven can contend for a D1 crown or make a deep run for that matter, I don't believe they are the caliber of team that should ever, in any way, shape or form lose to Wilton. I wasn't there, I didn't see it, but I have seen Wilton. According to all on site reports the question of heart was raised. Were the Yellow Jackets mailing it in? Did they not particularly exert all effort? Did they blatantly overlook Wilton? According to those in attendance and even some players, yes. Boy was that not the case last night. The Yellow Jackets had a much more difficult task in D2 power and SCC foe Amity. They rose to the occasion, led in large part by captain Matt Longobardi who notched a hat trick on the night, and beat the Spartans 5-4 in overtime. The win broke a two game losing streak with both losses coming to sub D1 teams. Where the Yellow Jackets go from here is anyone's guess. My knocks on them this year have obviously been their schedule which is proving to be more difficult than anyone could've guessed and their star power being overused. The aforementioned Longobardi, Mike Falanga and Tristan Goodwin account for the bulk of the Easties production and their constant leaps over the boards not only has the potential to tire them out but allow for opposing coaching to key them in terms of match ups. When those three are on, the Yellow Jackets are very good. If any of them has an off night, the team tends to go in that direction as well. Come tournament time, (East Haven needs one win or a tie to clinch) they better hope those studs are studly. ND Fairfield's La Croix battling. Six in a row and some big ones up ahead. The Notre Dame Fairfield Lancers have moved into prime spot for a state tourney birth. They've beaten some good teams and walloped the teams they're supposed to. After starting the season 1-5 with a measly win over Conard, the Lancers have run off six straight with wins over NDWH, Hamden, strong D2 squad New Milford and most recently age old power West Haven. They've been led in large part by junior goalie Stone Denbok who has wrestled the starting reins away from the Lancers' other two net minders. Denbok has only allowed 9 goals over the six game win streak while turning away 25+ shots four times. On offense, the Lancers are getting production from all over but are lead in most part by junior Christian La Croix who is the Lancers lone player at more than a point a game. La Croix is currently sitting at 23 points (12 G, 11 A) through 12 games. But they are truly getting contributions from all over and at this time they appear they can play with anyone. 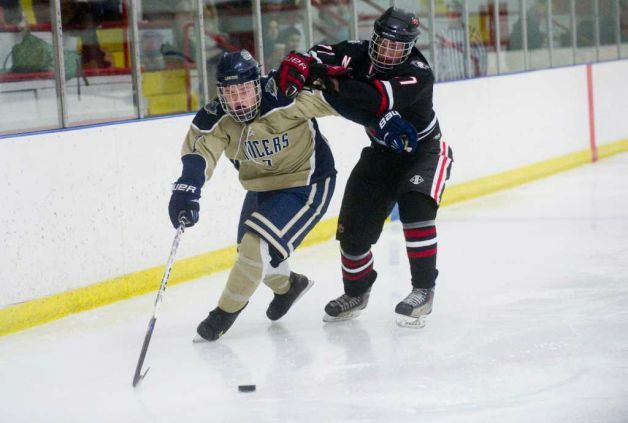 I think they are a different team than the team who lost 7-2 to Prep earlier in the year, but I still question whether they can keep that one close. Detrimental to their efforts is the fact that they'll be without sophomore goal scorer Jon Suporn who's out for the foreseeable future with a wrist injury. With quality D2 opponent BBD on the horizon and the evil empire Prep after that, the Lancers have continued opportunities to showcase the team they've become. The D1 race may be settled in some people's minds but the D2 race is alive and well due to some newcomers to the D2 ranks. The first tier of D2 teams is broken down as teams who've clinched a playoff birth. This list consists of SCC powerhouses Amity and North Branford, God-fearing Northwest and East Catholics, the big, bad, durable Brookfield-Bethel-Danbury and finally Watertown-Pomperaug. The next group features a group of SCC schools that can beat anyone at the D2 ranks on any given night. Daniel Hand, Guilford, Milford Co-op and recently emerging Branford are as dangerous as they get and no one will want to draw them in the tourney. Question marks linger around teams like New Milford, Fairfield Warde-Ludlowe and Fermi-Enfield, who've shown glimmers of brilliance and plenty of examples of doubt. have fb fan page? let exchanges likes.